A skilled Associate Business Analyst acts as the link between the organizations IT capabilities and its objectives, contributing towards the profit of the company irrespective of its size. 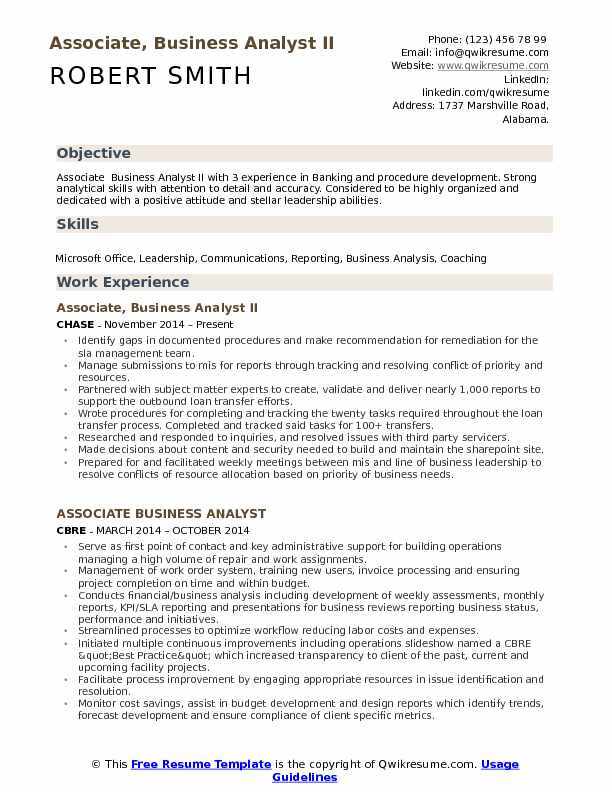 The Associate Business Analyst is a backbone for the company when the economic conditions are not favorable and when there is a day to day changes in the business environment, an Associate Business Analyst comes into the picture by managing the constant changes with his/her ability and agility. The prime role of an Associate Business Analyst is to help the management achieve its goal by launching new products and services. 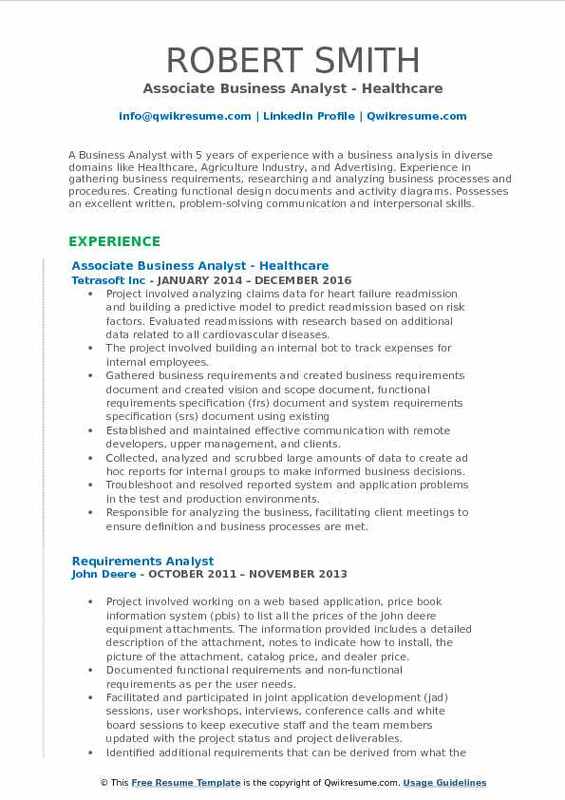 A well-built Associate Business Analyst Resume Sample will prove to be a gateway to success for any individual. Even though the educational qualifications required for the job post may vary from company to company, the entry level for this position requires a Bachelor’s Degree in Business Administration. 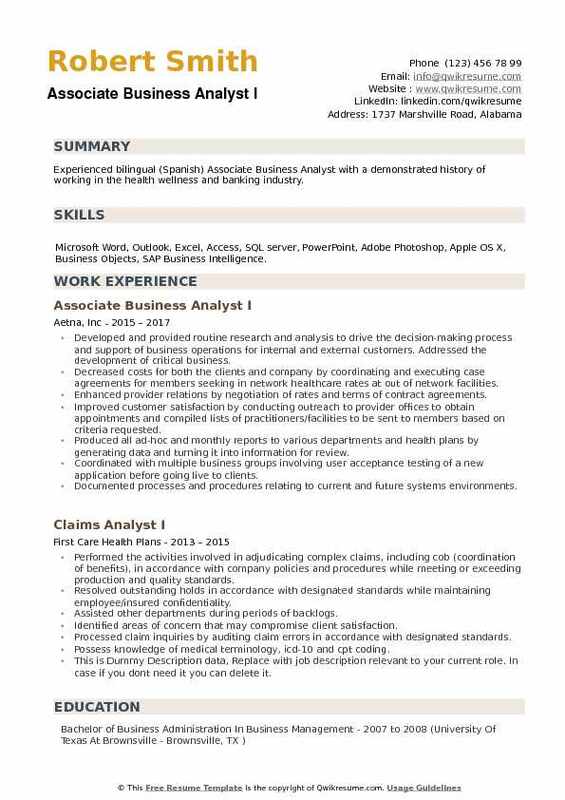 Objective : 2+ years of experience as an Associate Business Analyst in IT primarily in Finance, Healthcare and Media industries. Coordinated with business and IT across all phases of software development life cycle. Experienced in gathering, analyzing and documenting business requirements and developing Business Requirement Documents and Functional Requirement Specifications. Conducted interviews with multiple stakeholders to capture and create Business Requirements documents (BRDs). Translated business requirements into technical user stories for development teams. Defined scope and documented BRD or new enhancements based on requirement elicitation, operational constraints, information system architecture and project risks. Collaborated with stakeholders to identify requirements and recommend solutions to address business needs complying to operations and it controls frameworks. Created a standardized process document for the department to ensure successful integration of existing. Actively participated in the management of multiple projects at a time, ranging in complexity and size. Built relationships with co-workers, partners, and clients to enhance csg's professional reputation. Raised tickets for domains related issues (blues clues, ams), assigned them to various teams in order to resolve them. 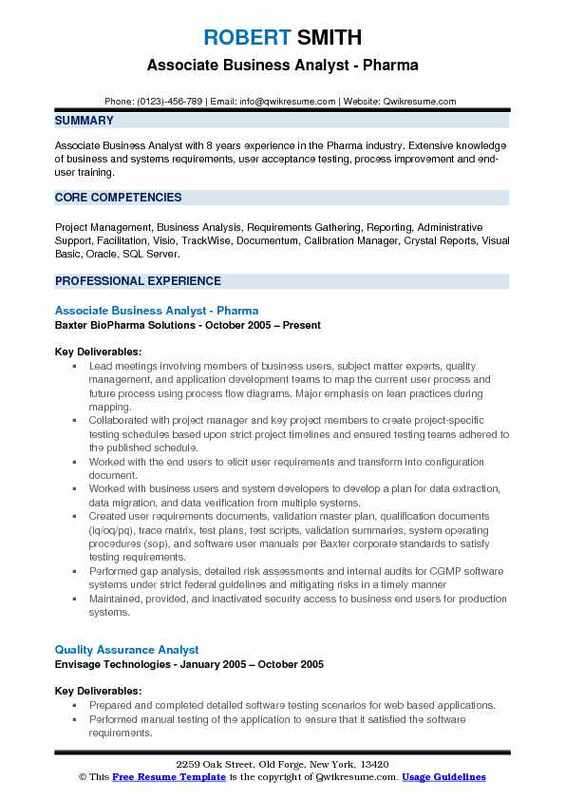 Summary : Associate Business Analyst with 8 years experience in the Pharma industry. Extensive knowledge of business and systems requirements, user acceptance testing, process improvement and end-user training. Skills : Project Management, Business Analysis, Requirements Gathering, Reporting, Administrative Support, Facilitation, Visio, TrackWise, Documentum, Calibration Manager, Crystal Reports, Visual Basic, Oracle, SQL Server. Lead meetings involving members of business users, subject matter experts, quality management, and application development teams to map the current user process and future process using process flow diagrams. Major emphasis on lean practices during mapping. Collaborated with project manager and key project members to create project-specific testing schedules based upon strict project timelines and ensured testing teams adhered to the published schedule. Worked with the end users to elicit user requirements and transform into configuration document. Worked with business users and system developers to develop a plan for data extraction, data migration, and data verification from multiple systems. Created user requirements documents, validation master plan, qualification documents (iq/oq/pq), trace matrix, test plans, test scripts, validation summaries, system operating procedures (sop), and software user manuals per Baxter corporate standards to satisfy testing requirements. Maintained, provided, and inactivated security access to business end users for production systems. 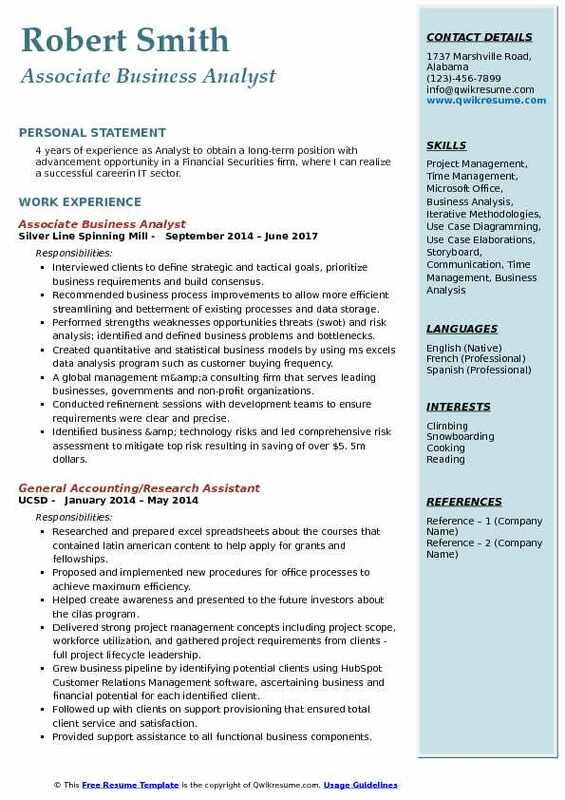 Headline : Dedicated and focused Business Analyst with 5+ years experience in Finance Industry who excels at prioritizing, completing multiple tasks simultaneously and following through to achieve the project goal. Committed to ongoing professional development and research to ensure currency and innovation in management and problem-solving. Investigate and provide insights on data mismatches in specialized invoices and payment detail reports according to corporate billing rules. Responsible for management of monthly analysis of units progress and other key forecasting tools utilized by senior management. Analyze all lines of business to determine acceptability and control, restrict or decline information according to company guideline. Documented and managed the analysis and the to processes for more efficient and immediate implementation. Developed a database for requisition and purchase order requests which allowed users to track requests and run. Gather project requirements from designated analysts, developers and work to implement changes from design phase to production. 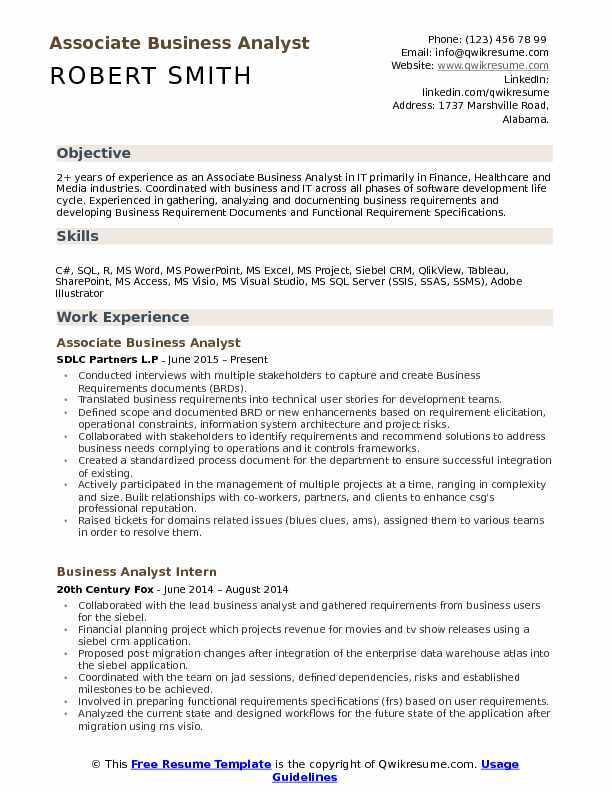 Objective : A Business Analyst with 5 years of experience with a business analysis in diverse domains like Healthcare, Agriculture Industry, and Advertising. Experience in gathering business requirements, researching and analyzing business processes and procedures. Creating functional design documents and activity diagrams. Possesses an excellent written, problem-solving communication and interpersonal skills. Project involved analyzing claims data for heart failure readmission and building a predictive model to predict readmission based on risk factors. Evaluated readmissions with research based on additional data related to all cardiovascular diseases. The project involved building an internal bot to track expenses for internal employees. Established and maintained effective communication with remote developers, upper management, and clients. Collected, analyzed and scrubbed large amounts of data to create ad hoc reports for internal groups to make informed business decisions. Troubleshoot and resolved reported system and application problems in the test and production environments. Responsible for analyzing the business, facilitating client meetings to ensure definition and business processes are met. 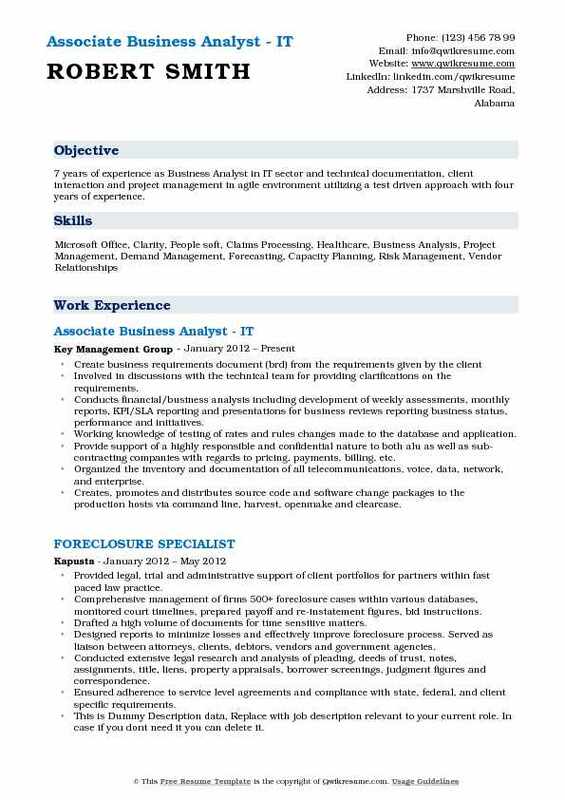 Summary : I have been in the insurance field for the last 8 years as a Business Analyst and Renewal Analyst Team Lead. I have marketing experience through my work with the Junior League of Little Rock that has sparked my strong desire to work in the social media and marketing field. Coordinated change control board meeting, maintained change management workspace in Aldon community manager, verified all request for change were properly documented prior to the meeting, provided weekly reports of all approved changes. Interviewed stakeholders to document software specifications and needs. Gathered requirements and translate business needs into clearly defined requirements. Configured software using Drools Guvnor rules engine based on customer requirements led meetings in order to communicate project updates both internally and with clients. Traveled onsite to train customers on installed software more details about the business analysis responsibilities systems request document- conducting analysis in order to submit the system's request to the project prioritization board. The analysis involves investigating possible solutions, time, resource and costs associated with each option. Process flows/data capture- understanding user requirements; creating process flow diagrams to replicate existing as well as new requested systems. Business requirements document (BRD) - capturing user requirements to create a brd that is signed off by various stakeholders writing test plans and scripts for uat/end to end system testing. Headline : 7 years of experience as Business Analyst in IT sector and technical documentation, client interaction and project management in agile environment utilizing a test driven approach with four years of experience. Involved in discussions with the technical team for providing clarifications on the requirements. Conducts financial/business analysis including development of weekly assessments, monthly reports, KPI/SLA reporting and presentations for business reviews reporting business status, performance and initiatives. Working knowledge of testing of rates and rules changes made to the database and application. Provide support of a highly responsible and confidential nature to both alu as well as sub-contracting companies with regards to pricing, payments, billing, etc. Organized the inventory and documentation of all telecommunications, voice, data, network, and enterprise. Creates, promotes and distributes source code and software change packages to the production hosts via command line, harvest, openmake and clearcase. Summary : Seeking a position as Business Analyst with 10 years experience in a well-managed company where I can use my supervisory and analytical skills.To acquire a position that uses my knowledge, experience, and skills to their fullest extent. Perform analysis and support the development of detailed performance reports for both internal and external use. Conduct basic modeling, forecasting, trending, and variance analysis, business case development and other financial and operational analysis. Track, maintain, analyze and provide current and relevant information on the operation business scorecard or key performance indicators. Support organizational observance to schedules, milestones, key performance measures, controls and procedures for consistent application across operations. Develop and provide relevant statistical information to ensure the most effective utilization of personnel, equipment and/or materials for business operations. Support the short-term and long-range business plan process. Provide analytical and operational support to the business unit. 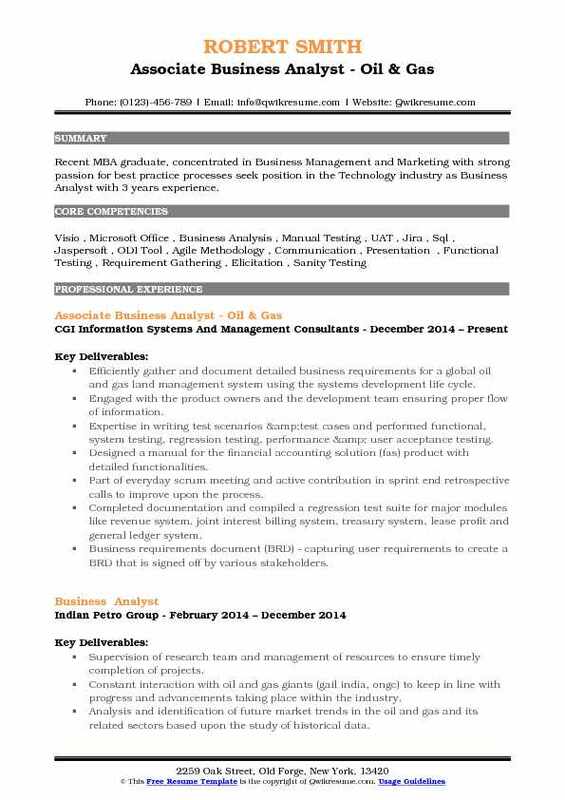 Objective : Recent MBA graduate, concentrated in Business Management and Marketing with strong passion for best practice processes seek position in the Technology industry as Business Analyst with 3 years experience. Efficiently gather and document detailed business requirements for a global oil and gas land management system using the systems development life cycle. Engaged with the product owners and the development team ensuring proper flow of information. Expertise in writing test scenarios &test cases and performed functional, system testing, regression testing, performance & user acceptance testing. Designed a manual for the financial accounting solution (fas) product with detailed functionalities. Part of everyday scrum meeting and active contribution in sprint end retrospective calls to improve upon the process. Completed documentation and compiled a regression test suite for major modules like revenue system, joint interest billing system, treasury system, lease profit and general ledger system. Business requirements document (BRD) - capturing user requirements to create a BRD that is signed off by various stakeholders. 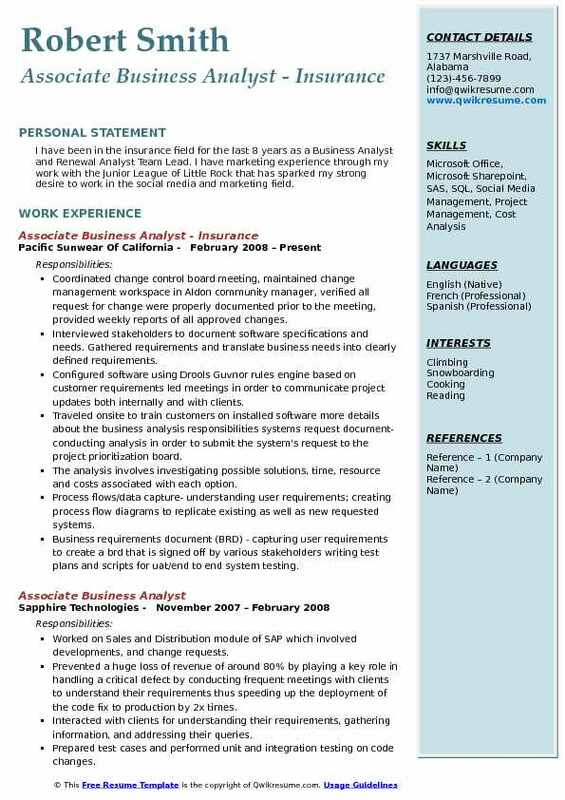 Objective : Seeking a position as a Business Analyst at a progressive company with 3 years experience. 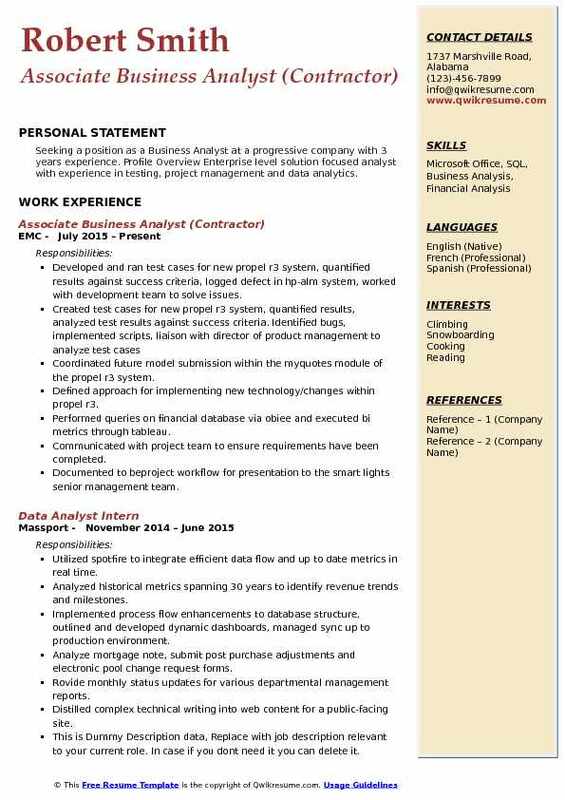 Profile Overview Enterprise level solution focused analyst with experience in testing, project management and data analytics. Developed and ran test cases for new propel r3 system, quantified results against success criteria, logged defect in hp-alm system, worked with development team to solve issues. Coordinated future model submission within the myquotes module of the propel r3 system. Defined approach for implementing new technology/changes within propel r3. Performed queries on financial database via obiee and executed bi metrics through tableau. Communicated with project team to ensure requirements have been completed. Documented to beproject workflow for presentation to the smart lights senior management team. Objective : Experienced bilingual (Spanish) Associate Business Analyst with a demonstrated history of working in the health wellness and banking industry. Skills : Microsoft Word, Outlook, Excel, Access, SQL server, PowerPoint, Adobe Photoshop, Apple OS X, Business Objects, SAP Business Intelligence. Developed and provided routine research and analysis to drive the decision-making process and support of business operations for internal and external customers. Addressed the development of critical business. Decreased costs for both the clients and company by coordinating and executing case agreements for members seeking in network healthcare rates at out of network facilities. Enhanced provider relations by negotiation of rates and terms of contract agreements. Improved customer satisfaction by conducting outreach to provider offices to obtain appointments and compiled lists of practitioners/facilities to be sent to members based on criteria requested. Produced all ad-hoc and monthly reports to various departments and health plans by generating data and turning it into information for review. Coordinated with multiple business groups involving user acceptance testing of a new application before going live to clients. Documented processes and procedures relating to current and future systems environments. Objective : Associate Business Analyst II with 3 experience in Banking and procedure development. 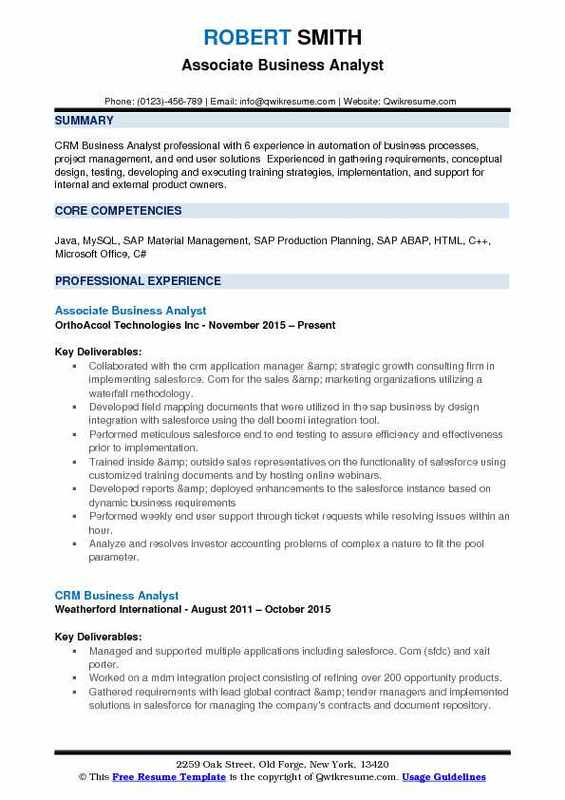 Strong analytical skills with attention to detail and accuracy. Considered to be highly organized and dedicated with a positive attitude and stellar leadership abilities. Identify gaps in documented procedures and make recommendation for remediation for the sla management team. Manage submissions to mis for reports through tracking and resolving conflict of priority and resources. Partnered with subject matter experts to create, validate and deliver nearly 1,000 reports to support the outbound loan transfer efforts. Wrote procedures for completing and tracking the twenty tasks required throughout the loan transfer process. Completed and tracked said tasks for 100+ transfers. Researched and responded to inquiries, and resolved issues with third party servicers. Made decisions about content and security needed to build and maintain the sharepoint site. Prepared for and facilitated weekly meetings between mis and line of business leadership to resolve conflicts of resource allocation based on priority of business needs. 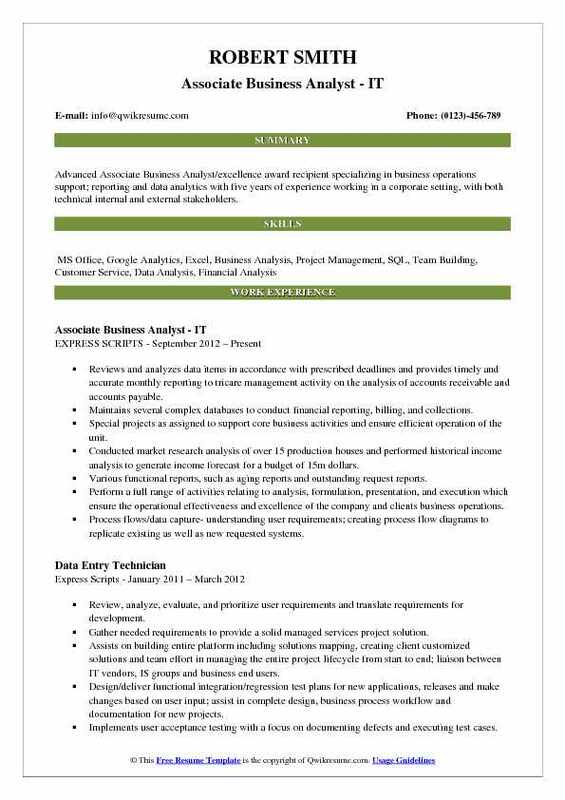 Headline : CRM Business Analyst professional with 6 experience in automation of business processes, project management, and end user solutions Experienced in gathering requirements, conceptual design, testing, developing and executing training strategies, implementation, and support for internal and external product owners. Collaborated with the crm application manager & strategic growth consulting firm in implementing salesforce. Com for the sales & marketing organizations utilizing a waterfall methodology. Developed field mapping documents that were utilized in the sap business by design integration with salesforce using the dell boomi integration tool. Performed meticulous salesforce end to end testing to assure efficiency and effectiveness prior to implementation. Trained inside & outside sales representatives on the functionality of salesforce using customized training documents and by hosting online webinars. Performed weekly end user support through ticket requests while resolving issues within an hour. Analyze and resolves investor accounting problems of complex a nature to fit the pool parameter. 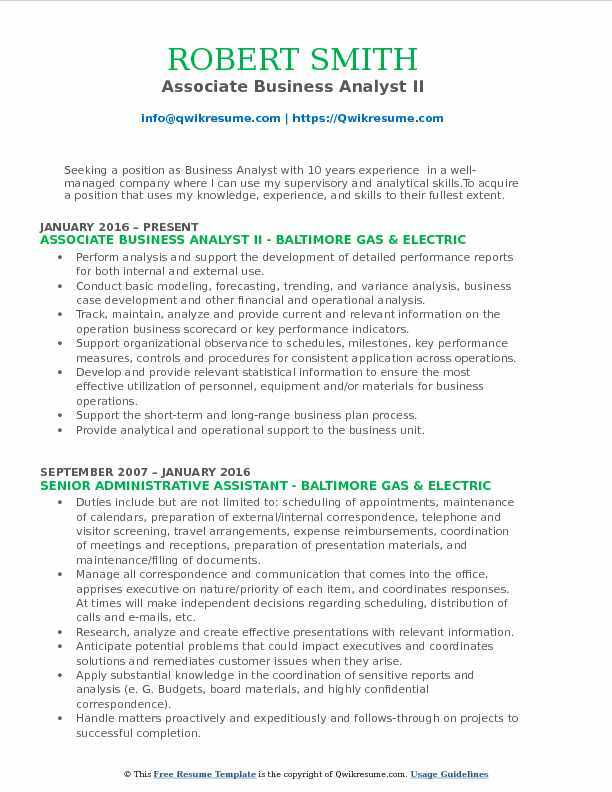 Headline : Advanced Associate Business Analyst/excellence award recipient specializing in business operations support; reporting and data analytics with five years of experience working in a corporate setting, with both technical internal and external stakeholders. Reviews and analyzes data items in accordance with prescribed deadlines and provides timely and accurate monthly reporting to tricare management activity on the analysis of accounts receivable and accounts payable. Maintains several complex databases to conduct financial reporting, billing, and collections. Special projects as assigned to support core business activities and ensure efficient operation of the unit. Conducted market research analysis of over 15 production houses and performed historical income analysis to generate income forecast for a budget of 15m dollars. Various functional reports, such as aging reports and outstanding request reports. Perform a full range of activities relating to analysis, formulation, presentation, and execution which ensure the operational effectiveness and excellence of the company and clients business operations. 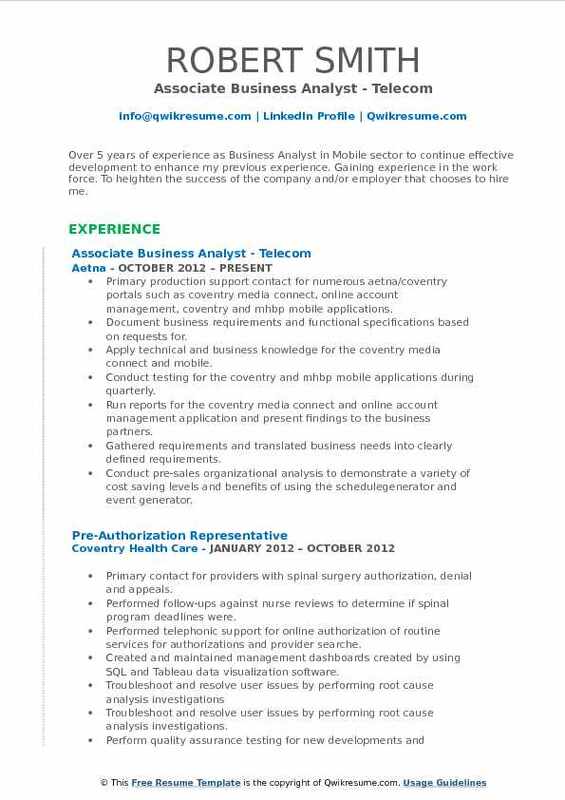 Objective : Over 5 years of experience as Business Analyst in Mobile sector to continue effective development to enhance my previous experience. Gaining experience in the work force. To heighten the success of the company and/or employer that chooses to hire me. Primary production support contact for numerous aetna/coventry portals such as coventry media connect, online account management, coventry and mhbp mobile applications. Document business requirements and functional specifications based on requests for. Apply technical and business knowledge for the coventry media connect and mobile. Conduct testing for the coventry and mhbp mobile applications during quarterly. Run reports for the coventry media connect and online account management application and present findings to the business partners. Gathered requirements and translated business needs into clearly defined requirements. Conduct pre-sales organizational analysis to demonstrate a variety of cost saving levels and benefits of using the schedulegenerator and event generator. 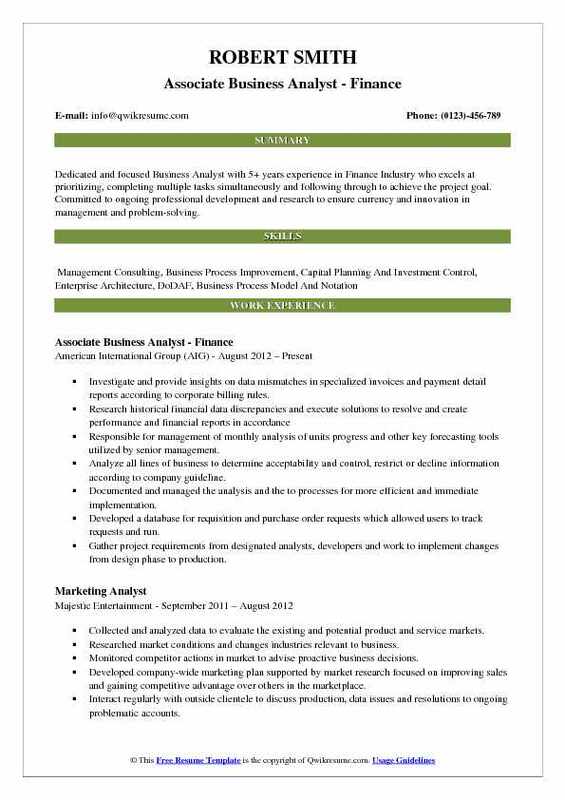 Objective : 4 years of experience as Analyst to obtain a long-term position with advancement opportunity in a Financial Securities firm, where I can realize a successful careerin IT sector. Interviewed clients to define strategic and tactical goals, prioritize business requirements and build consensus. Recommended business process improvements to allow more efficient streamlining and betterment of existing processes and data storage. Performed strengths weaknesses opportunities threats (swot) and risk analysis; identified and defined business problems and bottlenecks. Created quantitative and statistical business models by using ms excels data analysis program such as customer buying frequency. A global management m&a consulting firm that serves leading businesses, governments and non-profit organizations. Conducted refinement sessions with development teams to ensure requirements were clear and precise. Identified business & technology risks and led comprehensive risk assessment to mitigate top risk resulting in saving of over $5. 5m dollars.